COTA enhances the health and wellbeing of underserved women and children in developing countries through international collaboration. My first COTA mission to Peten was in January, 2000. We flew up to San Benito in a surplus C-130 with the door held on with duct tape. The medical team consisted of Dave Cunning and Tim Hulsey, doing lips and palates and me doing gyn. The director of that hospital was a surgeon named Eduardo Caseres. He and I have remained close friends to this day. The next year several New Jersey OB nurses joined us at San Juan Sachatepecez, a tiny hospital consisting of a few cinder block buildings around an open area. Also joining us were my Bride (Beverly my scrub nurse) and our youngest son, Alex. This team was the first time I brought an OB resident. We ate outside, and many of us slept on the floor. Alex made huge pots of Ramen noodles to feed the patients. We continued to grow and in 2005 we went to Huehuetenengo, one of the longest, most horrible bus rides in history. That year my friend Buzz Cortese came with us on his first of many COTA trips, a stand-up guy like none other. Also it was the first time I had 2 OB residents join us. One was Tori Myers and she brought her husband, Frank Bowen, a surgeon who has been a staunch COTA guy for 15 years and the current medical director. We stayed in freezing army barracks; The “bathrooms” were indescribable; the volume of surgery incredible. Around 2007 we went to Tiquisate; hot, humid and bugs. The director of that hospital was a surgeon, Marco Bautista. He was a great help to COTA for years afterward. Marco’s daughter Christy has lived with us in Cherry Hill every winter for the last 4 years. Ceele and her very tired mom. Ceele had extensive bowel surgery. Maria #1 Maria also had very extensive bowel surgery. She was 14 months old when she came to us and lived with us for 10 months. Maria#2 (below) also had bowel surgery, colostomy, rectal and vaginal repairs. Jessica (below) 17 years later. Two trips to the US to repair her foot and leg. So, 20 years of COTA. 19 medical missions, 15 scouting trips, 6 foster kids. 37 Ob-Gyn residents who are at least marginally better surgeons for having been here. Its always a risk when you start naming people who have been important in your life because you always leave out someone. However, I want to mention Rosemary, Jody, Aida (yes, Aida), Henry, Roger, Bobby, Lisa, Anne, Diana and the many others I have had the honor to work with. Don Cannon will carry on the Gyn program. So many people come on a mission, say “Oh, thank you. This was really nice.” And are never heard from again. For others of us, it is a life-changing experience. Bobby Edwards recently stepped down from our Children of the Americas board. Leaving the board is not the equivalent of leaving the organization. 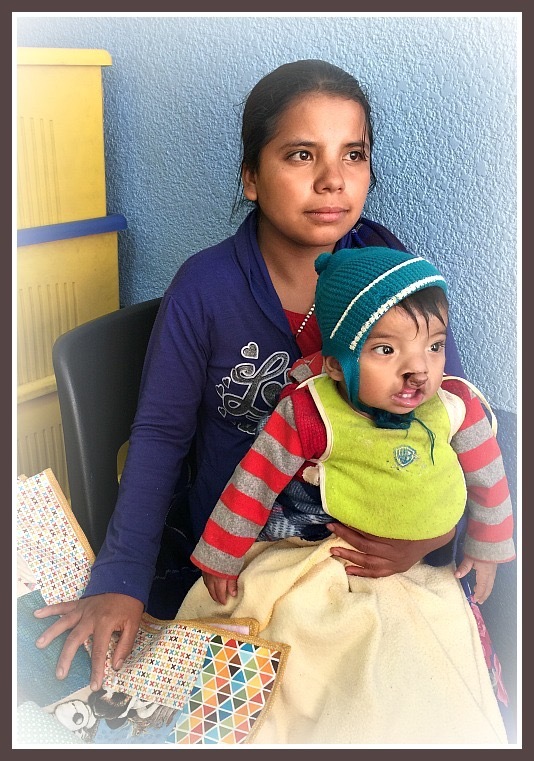 Bobby and his wife Lisa will continue to do what they do best: making sure our small but significant medical nonprofit delivers humanitarian medical assistance to women and children in Guatemala. They will work tirelessly, communicate quietly but with intention and will demand more of themselves than from others. 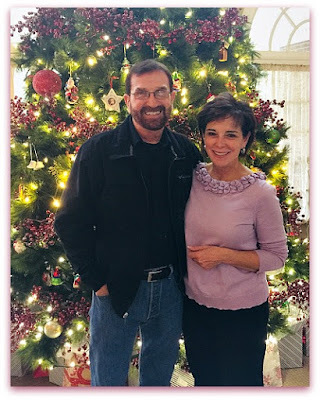 Because this unassuming couple prefers to remain in the background, I wanted to tell you more about Bobby, and why he, Lisa and our COTA volunteers feel like family. 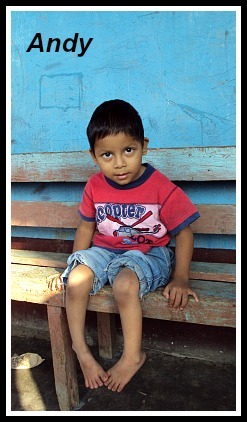 The photo (below) was taken in 2001 as I was preparing to board this small Guatemalan government-owned cargo plane. Our destination was to be my first team site: the remote Guatemalan city of Flores. My hands were shaking so hard that Bobby is a bit out of focus! Our COTA team consisted of 36 volunteers, many of whom had traveled with COTA in past years. 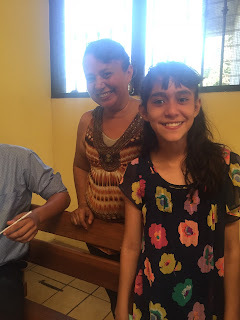 A few of us were new to the group, to Guatemala and to the fear that ate away at our gut. Women have a gift called intuition. Everything in me at that moment told me that I should listen to this inner voice and not board this "air coffin." Not only were the hinges of the plane held on with tape, but as you can see, the tape, for what it was worth, wasn't adhering well. 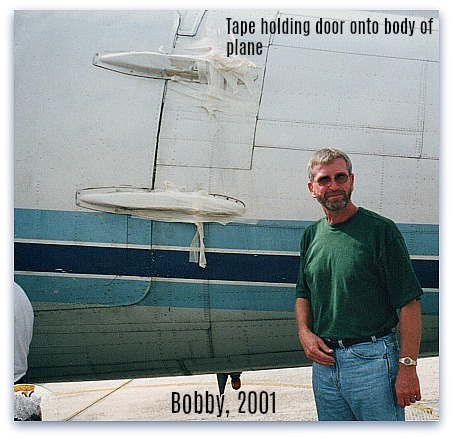 In the end, I left my intuition on the tarmac and followed Bobby into the belly of the plane. Leaving the Edwards behind was more terrifying than the thought of strapping myself into a jump seat of a cargo plane piloted by Guatemalan army members who seemed a bit unnerved themselves. Having only met this lovely couple the night before, this sudden 'Velcro' attachment was out of the ordinary for me. I was struggling with separation anxiety (I left three young children at home in the states). The allure of going to Guatemala, which previously sounded mysteriously amazing, now felt like an impetuous decision, and my inept Spanish was crippling my ability to see to the most basic of my needs. In my mind, Bobby and Lisa were my thin but tenable lifeline. I would have followed them anywhere. And for many years I did. In a few weeks the Edwards and I will be departing for our 19th COTA team together. I have left the board Vice-Presidency in very capable hands. The three of us have shed our board labels but not our hearts for COTA and all our organization represents. 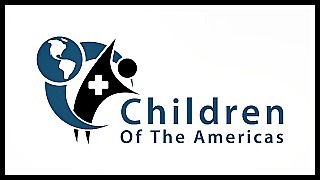 Through our association with Children of the Americas we have had more adventures of the heart and body than anyone has a right to claim. Fostering COTA stateside patients, attending to in-country patient care needs and forming solid friendships with COTA volunteers has molded us into the people we were meant to be. None of this was on our minds when Bobby, Lisa and I stepped onto that plane 18 years ago. We were simply following our hearts, along with Joanne Curreton, Jeanne Shepherd and Warren Brandwine; team members who continue to travel with us to this day. People often ask us how we found Guatemala, and thereafter decided to make this particular country our heart space. My answer is that Guatemala found me. As the saying goes: Your heart is where your home is. And home is where family resides. Friends are the family you create for yourself. Our COTA "family" was forged the same way a birth family is. Sharing the joy of restoring health to a child; grieving with a Mayan mother while she accepts the inevitable death of her child; watching a team member struggle with a long-term illness....those events have shaped us into a group that feels as connected by birth as we do by happenstance. We know each other's strengths, weaknesses and breakdown points. 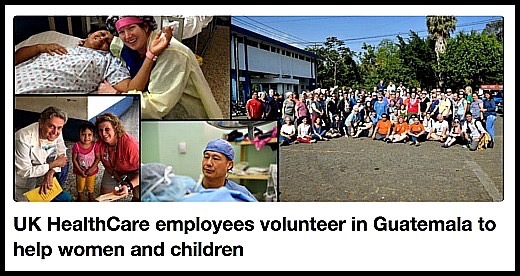 Our new volunteers can join us knowing that we will be there to support them as they acclimate to a new way of providing healthcare in a culturally complex country. Nineteen years later, Jeanne has still not convinced me that black beans should be considered a food product. I still don't know more than two words of Spanish and tummy trouble precedes every team trip. But for one week in January, Bobby, Lisa and I will be with 100+ Children of the Americas volunteers who will work out the complex and difficult issues of running a medical team for thousands of patients in Guatemala. It is what we do. Together. As a "family" of like-minded volunteers. Children of the Americas volunteers are masters at multi-tasking, but as our core group of board members age, this method of keeping up with our responsibilities becomes less effective. A perfect and recent example would be the thoughtfully written and informative blog post that was recently ready for launch with the gentle press of a "send" button. While distracted by the phone call from a distressed daughter, the "undo" button seemed to make sense to my overloaded brain. Once undone, there is no turning back. Cyberspace is now the unique owner of all I was going to tell you about how Team 2018 and Maria (with toddler in tow) came together in a few short but critical days in January. That blog post is now the Post That Never Was, nor will it ever be. Spared the numerous details of how this seventeen year old Mayan mother found the resources and gumption to travel many hours to help her son to receive the one chance at a cleft repair, our readers are now free to simply enjoy the before and after photos of what is truly an alignment of the stars of good fortune for mother and child. The photos tell their own story. The words I used to describe Maria and her experience are reflected in her face. The missing story is present after all. Our organization does our job remarkably well. So well that we have thousands of former clinic patients throughout Guatemala. What we don't have the luxury of is learning the personal stories behind the women and children we assist. Getting a glimpse into their lives is both fascinating and inspiring. The women of Central America are resilient, and as you can see from Manuela's story, resourceful. Manuela was married legally decades ago. Her husband left her because she didn't give him sons, although she had at least one daughter, who is now an adult with her own child/ren. Manuela, who lives in the town of Chajul, says she was married in the church and didn't want a divorce, nor another man. She parents three children - none of whom are her own. 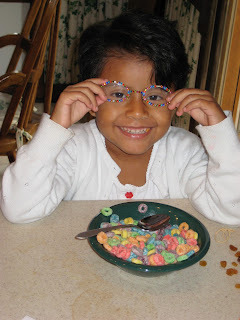 I think the eldest, Clarita, is a grandchild. Pedro may be a relative, I'm not sure. The baby Jacinta was born a premie and left on Manuela's bed in her house when she was not there. She didn't know where the 2 1/2 lb. baby came from but she took it in as her own. 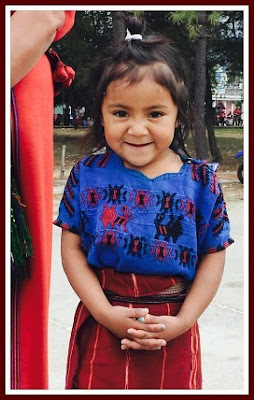 While I was still living in Chajul, Manuela, who speaks some Spanish, came to me with a mother who only spoke Ixil, who needed help with her daughter's condition. After I interviewed the mother and they were leaving, Manuela asked me if I had any food for a tiny premie, then told me the child's story. I had some Ensure and boxes of powdered formula which I got from a COTA mission and I gave her some every few weeks. Manuela is a true mother at heart to these three children. When I suggested Clarita get the spot on her nose removed during a COTA mission, she and Clarita came, and Manuela brought Jacinta who was then about 5 years old. She captivated the folks in the Peds. ward! She is precocious but quite small and could use something to stimulate her growth. I've not been in Chajul for a couple of years. Manuela recently called me to thank me for the help I gave her with Jacinta. She said Jacinta will go to first grade next year. Every January, Children of the Americas transports a team of compassionate, gifted and enthusiastic medical and support volunteers to Guatemala. Those of you who read this blog regularly know what we do and why we do it. What is less well-known is the individual identities in our lives back in the states. 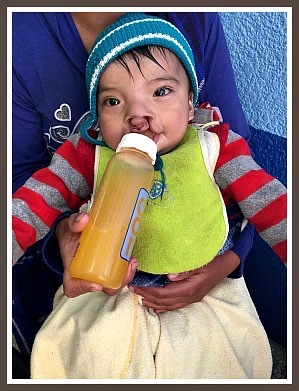 As a medical team in Guatemala we are cohesive, synergistic and dedicated to our mission purpose. The article links (below), recently published by the University of Kentucky Medical Center, offer great tributes to some of our outstanding COTA volunteers. 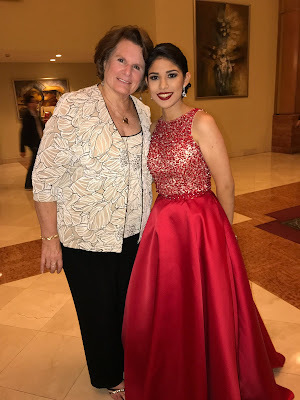 Many of our COTA volunteers have received professional accolades and social media publication showcasing the work they do on our Guatemalan teams. Each and every time we read about "one of our own" we have a deeper understanding of why the Children of the Americas board is so proud of our volunteers. 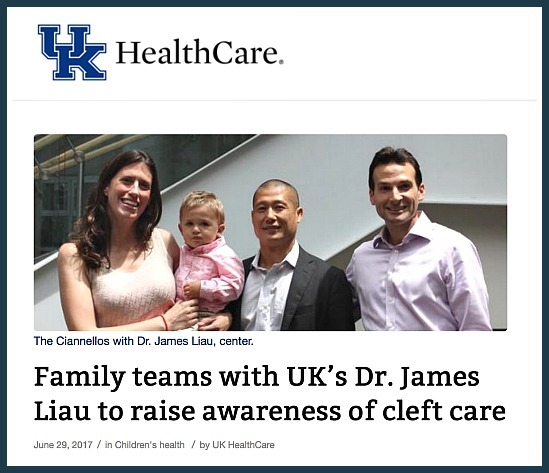 Dr. James Liau is a pediatric plastic and reconstructive surgeon practicing at the University of Kentucky Children's Hospital here in Lexington, KY where COTA is based. His surgical skills have restored health and emotional well-being to hundreds of Guatemalan children during his years of traveling with us. As is evident in this article, fear and uncertainty are common denominators that cross geographical and social boundaries when parents are faced with the challenges of negotiating medical care for a baby with a complex surgical need. Dr.Liau and his COTA support team are adept at meeting the myriad of emotional and surgical needs of both the child and the parents when it comes to cleft reconstruction. His UKMC support staff do the same here in the states. No matter what country our volunteer medical and support staff work in, the commonality of the human experience is the single most profound take-away we bring home with us. In these times of increasing political and religious division, we think that is a valuable lesson indeed. For the majority of Children of the Americas volunteer team members, our medical team starts the day they land in Guatemala. That initial day in January is an intense experience both physically and emotionally. 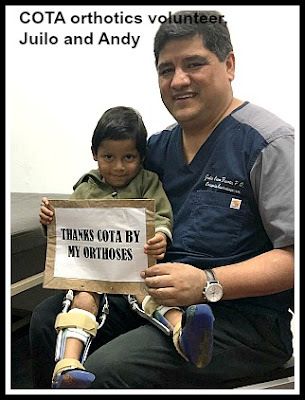 The year between COTA medical teams melts away as we join up once again to provide donated medical care to rural Guatemalan women and children. Our hotel rooms have been matched to each volunteer, the evening pre-team presentation has been carefully orchestrated and our team seems to miraculously meld into a group (originating from over 20 different cities) that comes together for a common purpose. 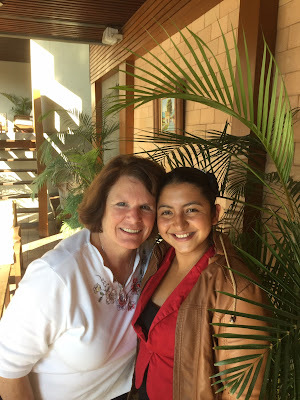 In other words, the mirage of of a smooth transition of 110 volunteers who synergistically play out their respective roles for a week in Guatemala would put any Broadway play to shame. Question any team member about what Strategic Planning Sessions for the COTA board looks like and you would get a puzzled look. Discussions about Communications structure, Succession Planning and Operational structure are not topics that the majority of our COTA medical volunteers think about. A strategic planning process identifies strategies so that a nonprofit will achieve its mission. Ideally, as staff and board engage in the process, they become committed to measurable goals, approve priorities for implementation, and also commit to revisiting the organization’s strategies on an ongoing basis as the organization's internal and external environments change. Many nonprofits start the process by identifying the nonprofit’s strengths, weaknesses, opportunities, and threats, in what is commonly called a “SWOT” analysis. 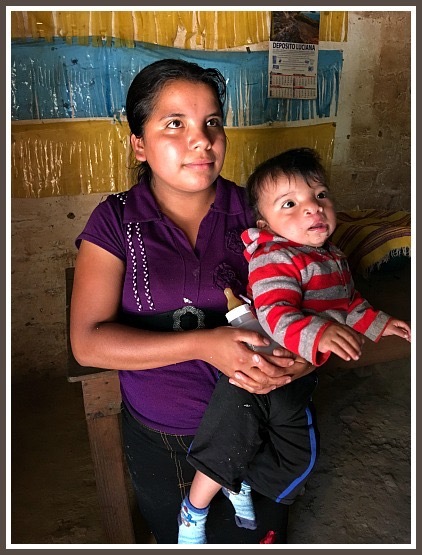 Instead, ask a team member how to smoothly transition 2,000 Guatemalan women and children through a five day clinic and they can eloquently describe the process. Start discussing Strategic outcomes for a long-term viable nonprofit organization, and eyes gloss over. The question then becomes; which is the most important? At the end of the hardest-week-you-will-ever-love, COTA volunteers gather for our annual team photo. 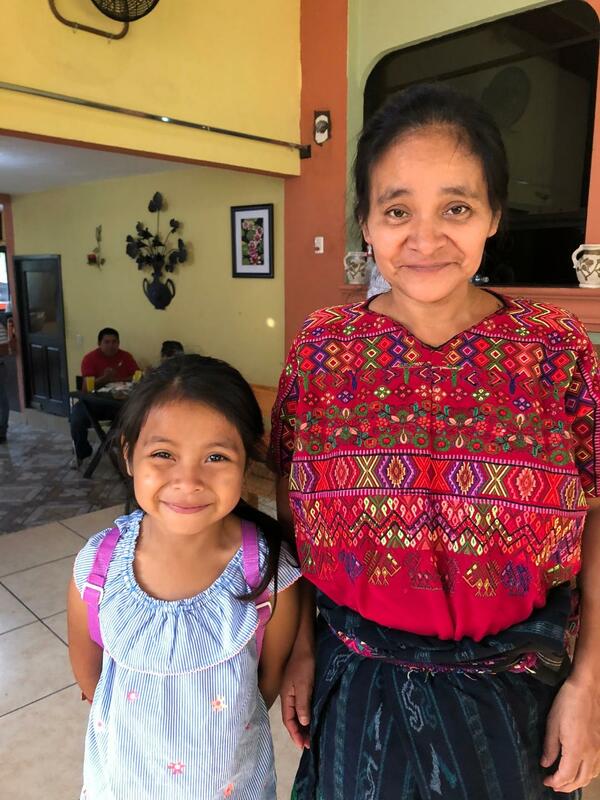 Smiles are broad, hearts are happy and we all leave knowing that we gave quality medical, dental and surgical care to thousands of rural Guatemalans. But in that team photo, there are a few dedicated souls who are already thinking ahead to how the next COTA team can be more efficient, professional and viable. Executive board members and key team administrators are brain storming about post-team surveys and vital statistics to utilize for fundraising. We are deep in thought about how to best communicate our accomplishments to our donors. 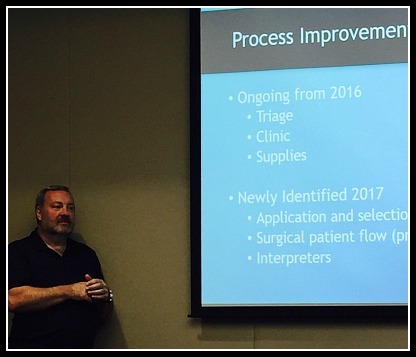 Our team coordinators are making notes for future discussions on how to facilitate a smoother patient care experience on future teams. Our board is planning for the inevitable replacement of key administrative leaders, team coordinators and medical volunteers. Bundle these individual thought processes together and you have an end product that keeps COTA focused on the future mission focus and viability of our program. In other words, without strategic planning, what happens on the front end of a Guatemalan medical team would never be possible. Maria (above left) would not begin to understand the logistical aspects of board governance, planning and progressive movement. She wishes only for a foot repair that for twelve years has been out of the reach of her farming family's meager income. With the dedicated strategy planning guidance of COTA board members Frank Sheeder and Nancy Vastro, our organization will be in Guatemala once again. And Maria will walk normally for the first time in her life. Editors Note: When compassionate people from three different countries combine their efforts and resources, the results are nothing short of life-changing. The following blog post was written by Lesley, a Canadian tourist who happened to run into a COTA voluteer at just the right moment. A circumstance or a miracle? You decide. When we first arrived in the first town Nueva Santa Lucia we stopped in the center of the village. Within a few minutes many people had gathered around Juniper as I think it would have been a first to see a white baby for many of them. One of the women asked if she could hold Juniper. I handed her over and Juniper was happy to visit with a new happy face. It seemed like seconds before I turned around and Juniper was nowhere to be seen. I had a little fright and told Vicente (our Guatemalan guide) what had happened. He laughed and said that they had probably taken her to show their families. He quickly told me that we would go and find her. It only took about 5 minutes and a walk down a series of footpaths through gardens and backyards to find her surrounded by about 20 kids. One of the kids was a four-year-old boy named Andy. Andy was sitting by himself a little bit removed from the other kids. We stayed there for about an hour talking to the family and playing with the children. While we were there we found out that Andy had been born with both of his feet fixed into a point position and sharply turned in. Colin (my husband) asked the mother where her husband was and she told him that he had died. He also asked what the condition was that Andy had and she said that she didn't know. Colin couldn't believe that a mother couldn't even understand her son's physical disability. Andy had never walked and he was 4 years old. The mother showed Colin that he couldn't walk by picking him up and moving his legs. His feet were crooked and absolutely stiff. The mother said she tried to contact a doctor but he wouldn't talk to her because she had no money. One of Colin's feet were turned in when he was born and they just put his leg in a cast for a couple of weeks and said it was no problem. 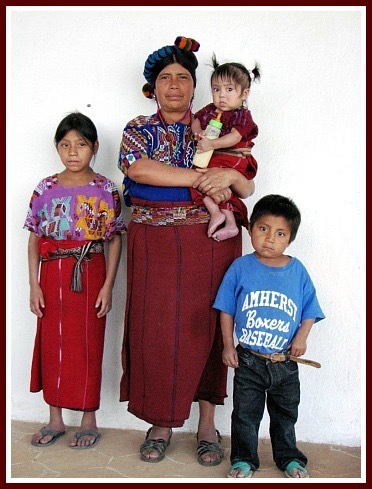 People in Guatemala aren't usually born in the hospital though and there was no doctor in the village. We told Vicente about this in the morning as he was out negotiating a room for dinner and us to stay in. The next day at breakfast he acknowledged that he knew about that little boy and had a hard time seeing him because it was so sad for him to see those kinds of problems in the poor villages. He said he was thinking about it last night and he wanted to take a picture of the boy and put it on social media to try and get enough money just so the mother could get the transport to a hospital and be able to pay for the doctor. When they found him we took some pictures and Vicente was very persistent in telling Andy's mother that he didn't know what would come of it, he did not want to give her false hope. We left the town that morning and continued our journey. A few days later I was walking through the streets of San Pedro and a lady stopped me and asked me if I knew where she could get a good cup of coffee. I was just walking around with Juniper waiting for Colin while he was in school so I told her that I would walk with her to a good Italian place. When we got there she asked me if she could buy me a coffee. I said sure and we sat and chatted. She told me that she was a doctor on a surgical mission trip with a group of doctors from the US. I connected Andy with her in my mind but was a little shy and thought it would be way too much to organize and coincidental for a connection to be made. I left the coffee shop to get Colin but the possibility of this little boy getting help was weighing heavy. I quickly returned because I thought at least I could get the name of her organization and pass it on to Vicente. When we got there Vicente was actually sitting in the same coffee shop a few tables away. I talked to the doctor, her name is Kaye, and she was actually really excited to see if she could help this boy. We brought Vicente over to the table and I did my best to try and translate, thank goodness for the few weeks of Spanish school. Kaye said that she would email me after she spoke with her supervisor and we would do our best to see if an operation or at least an examination would be possible. It was Wednesday and COTA was going to be doing operations starting the next Monday for a week. The good thing was that the hospital that they were doing these operations in, Retalhuleu was relatively close to the town where Andy lives. Relatively meaning that it was a 2-3 hour hike and two different camionetta rides (a pickup truck with a bar down the middle of the back that people can stand up and hold onto). Vicente said that if he got the word that the doctors could see Andy he would go to the village from San Pedro (where we were) about a 2 hour hike and a 1 hour camionetta ride, to carry Andy to the hospital from his village. The next day I was walking around San Pedro and I ran into Kaye again; she was out of breath. She said that she had been looking for me for an hour because she had some urgent info. She said that not only could her group examine Andy they also had 1000 Quetzales about $200 for Andy to pay for the journey and food and hotel for Andy and his Mom while they were in Retalhuleu. I was buzzing, this was great news. I was also a little in disbelief and not wanting to get too hopeful because so much had to come together for this to work. We quickly went to find Vicente to give him the good news. This wasn't easy as I had no idea how to find him but after asking a few people we found out where he lived and walked there. He was overjoyed. We made arrangements while Vicente's nephew watched Juniper. Kaye also gave Vicente the phone number of a translator that he could call as soon as they arrived at the hospital. She said they would need to call, as there are usually line-ups of people waiting outside of the hospital when their group is there and he would be able to come right in if they called first. Kaye was in a rush so she took off right away after that. I said good-bye to her and quickly went to find Colin to tell him the good news. I was buzzing. I thought that was really nice of her to spend her few days of vacation before some intense work to find me and help us make this happen for Andy. Colin got really excited and said that he was going to round up a few people to accompany Vicente to help him carry Andy on the 5 hour hike to the village to find Andy and then on to the hospital. Colin got a few friends together and they made a plan to go on Sunday. There was so much excitement and energy around this where we were. In the past I have travelled to many countries where I have seen so much sorrow and illness and felt helpless amongst it all. Now it felt like such a blessing to us to have seen something that pulled at our hearts and been able to do something about it. Maybe, just maybe, this could work and Andy just may be able to walk and play with his friends. The funny thing was that Andy and his family had no idea what we were up to and that his life was about to change. Sunday came and Vicente, Colin and 3 others packed up at 5:30am to start the journey. Vicente had gotten a hold of Andy's family and told them to be ready for the journey. 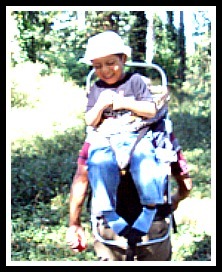 Vicente had an old metal-framed backpack and he built a wooden seat on it to carry Andy. Vicente told Colin that he was so excited and thrilled the night before that he hadn't slept all night. They jumped into a cameoneta and headed out to a remote village about an hour away. When they arrived they jumped off the truck and walked through the village and out the other side dropping out of civilization into the jungle paths of the western highland mountains. 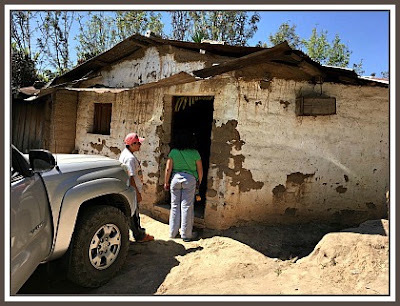 When they arrived at Andy's house Vicente was very clear that they were just going for an examination and that there was no guarantee that they would be able to do surgery. They strapped Andy up into the carrier and made the journey in good time. When they got to the hospital Vicente made a phone call and they passed the big line up and went on in. Colin and crew found the bus back to San Pedro, as they wanted to get back the same day and Vicente stayed with Andy and his mother. At that point Andy was scheduled for an examination on Monday, the next day. Vicente came back on Tuesday and said that the examination showed that surgery was possible and that they would do it on Wednesday. Andy got his operation to fix his legs and is now wearing braces for the next 6 months and when he takes them off he can begin to learn how to walk. Vicente returned the weekend after that to carry Andy back to his village. He said he didn't need help and actually did the 2-hour hike in 3 hours with Andy on his back by himself. The crazy thing is that that hike is mostly up hill in that direction. I hope that I have that much energy at 61. We heard from Vicente that his mother was really happy because the morning after the operation she saw him sit up for the first time by himself. It was such a joy to be a part of this adventure. I am hoping to hear about the progress of Andy but our only connection is through Vicente who doesn't use the Internet so I guess we will just have to go back and visit. A mother and her daughters await care in a COTA clinic.